I love food. And I have a love/hate relationship with all things related to food preparation. To be honest, since Cal was born I skew strongly to the hate side of that relationship. This is why I instantly replied YES PLEASE! to an email I got from a personal chef named Brooke, asking if I would like to try her organic soups. I’ve never gotten an email like this before, but Brooke sought me out because I’m a doula and she and her business partner are trying to cater to new moms in the Bay Area. When someone else is cooking, I’m pretty easy to please. Even so, I guzzled down Brooke’s chicken vegetable soup (made with bone broth!) like my life depended on it. It wasn’t just good. It was a complex-flavor-y, nutrient-dense delight. Cal kept wanting MOWAAHH, and as I spooned it into his open-baby-bird mouth, I did what many mothers are amazing at doing: I transformed a really nice moment into a guilt-laden one. 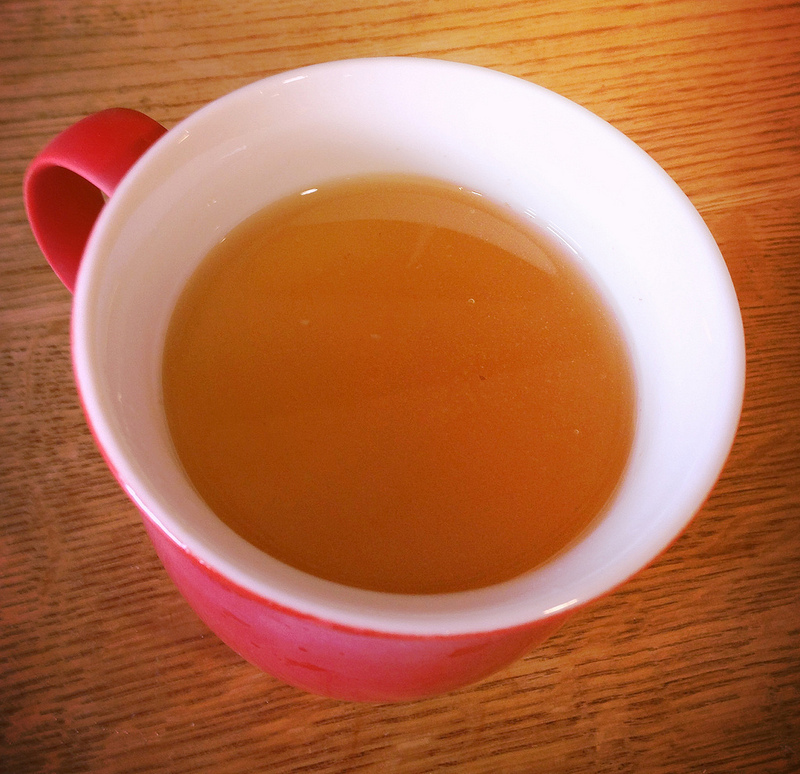 Here is a metaphorical cup full of guilt…er…bone broth. I know how great bone broth is, and given enough time and supplies, I’d bathe my kids in it. But the last time I made one was eons ago. And that’s because every time I try, it takes hours and winds up tasting like greasy animal water. So how the hell did Brooke get the bone broth base of her chicken soup to taste so terrific? And would I ever have the energy or desire to do such a thing? Titillated? Well continue on, dear reader. Brooke is about to illuminate the finer points of bone broth for those of us with teeny-tiny attention spans and even less desire to cook. Bone broth is the result of simmering bones (usually either cow, chicken, or pig) in water over very low heat for anywhere from 6-48 hours. Over this time, all of the nutrition in the bones is leached into the water leaving a rich, nutrient dense broth. You can drink the broth on its own, use it as a base for soups, or use it in place of water to cook grains and legumes like brown rice, quinoa and lentils. You can store chicken bones in the freezer until you have enough to make a broth. If you don’t have vegetables on hand or you are missing one, do not let that stop you. The important thing here are the bones. Everything else can be left out if needed. If at any time the broth is boiling turn down the heat. It should be at a quiet simmer. Place all ingredients in slow cooker and cover with water. Turn slow cooker to low, leave slow cooker lid off, and let simmer for 8-12 hours or overnight. Turn off slow cooker and allow broth cool in the slow cooker for an hour or until it’s no longer too hot to handle. Place the canning funnel on the jar to help avoid spillage. Set the fine mesh strainer on top of the canning funnel. Ladle the broth through the strainer into the jars leaving 2-3 inches of space at the top of the jars (in case you want to freeze it). Any fat in got into your stock will rise to the surface as the broth cools and can be skimmed off later. Toss the bones and the veggies in the compost. All of their nutrients will have been leached into the broth so they will have very little nutritional value left. Place your broth-filled jars in the fridge to cool. Label them with the tape and marker and include the date. Broth will be good in the fridge for 7 days or freeze to use later! *Freezer tip: Freeze with the top off to allow room for expansion- it will help keep the glass from breaking. Once frozen put the top back on. Thank you, Brooke, of Bee & Biscuit, for making bone broth seem like an attainable goal!! And thank you, even more, for bringing a jar of delicious soup to my house that day. In Japan, they cover the bones, bring the water to a boil, then pour out the water and rinse the bones to remove coagulated blood and proteins. Then they fill with new water and do the lengthy boiling. FYI. Interesting! What’s bad about coagulated blood and proteins? Also do they start w raw bones? My mom made me tons of bone broth right after O was born. I had it alternating with a few other soups for a month. There was the fish soup, the pig trotter soup, the sesame and black chicken soup. She also did what Lauren mentioned, washing the bones after boiling and then start over again on the stove (something about impurities). She started with raw bones. And she says the vinegar is really a big part of drawing out the minerals, but I’m not sure if that’s just ancient Chinese traditions or truth (and often things are both!). Glad to see a slow cooker version, thanks! I always know the value of bone broth but having a slow cooker version means I will actually get those bones out of the freezer that I save (I would be using leftover bones from roasting) and use them!